The Avengers International Fan Forum Forum Index -> Mission... Highly Creative! 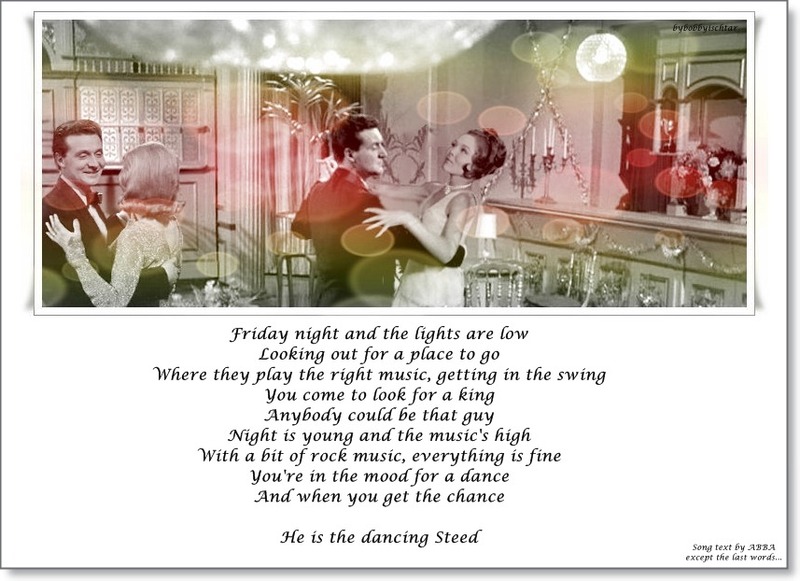 I know the lyrics... it's "Dancing Queen", isn't it? Watch out Tony Stark and all you false Marvel Avengers, because John Steed is powering up his reactor! And his is an Iron Man! That happens when I'm chatting with Sinus1994. He did almost anything for Mrs Peel - even wearing a funny tie By the way: Is it Freckles? I think Freckles dog-collar was different, but I'm not sure. Anyway, it's a marvellous work. Just a note to say that I've opened up a deviantART account. It's stuff that you might have already seen on Daub & Blot (still dormant) and my Photobucket page (click image below), however it's exclusively for Diana Rigg/Emma Peel 'Pop Art'. Neat, Dandy! I'll keep an eye on that, as I do the Photobucket account. I've saved so much of your stuff, I really ought to create a separate file for it. Keep up the good work. They've been noticed by Google Images as well. 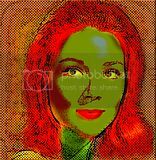 I see them popping up when I type in "Emma Peel Pop Art" something that wasn't happening on Photobucket. slick..lol.....nice picture...got a kick outta it.. Some talented fellow has turned his art skills to the TNA cast, making me wish once again that my drawing skills weren't sub-par. Joanna and Patrick prove themselves once again to be more conducive to capturing a decent likeness. Gareth, alas, like Diana before him, has always been pretty hit-and-miss when drawn. It's not terrible, but they've made him a little too grim (although Purdey looks pretty deadly, too, so maybe they're having a really bad day and their patience is wearing thin? Steed seems cheerful, at least). Steed and Mrs. Peel in the graveyard - good art-fan. Sinister, but as subtle humor it is quite witty. I remember a phrase "Mrs Peel, we're inseparable" in the episode "The Positive Negative Man". Sadly, more no one posted here own Halloween art creativity. Happy Halloween! How are you? Yesterday, I clearly felt that I was missing the Halloween The Avengers mood and this picture lifted my spirits. Well, I personally have never celebrated this holiday, as I'm used to the old russian traditions, but it's always great to see something similar to the Avengers. Funny art and the opportunity to have a great time. Well I found this picture very much in the style of the Avengers, as if they for example did parody on series Randall And Hopkirk (Deceased) in 1969. You have a similar feel? Well hello Denis! So lovely to hear from you. My comrade from afar. I think that sums it up nicely-about Randall and hopkirk Deceased. There would be a good show to watch for Halloween. So I have a question for you? WHat do you think of the character Old Gorky in Legacy of Death? THe humorous Russian who breaks wine glass after wine glass in Steed's apartment. Is this really all cliché and parody. How about his accent? I should look up the actor. He has convinced me he is Russian but no doubt it was a talented Englishman. We may have discussed this before, but do you recall what other episodes portrayed Russian characters and what did you think of them? Thank you Piers. Most interesting is he was the fiddler on Fiddler on the roof. A truly brilliant character actor-as he had me convinced he was indeed Russian. Is it true that it’s a Russian custom, and in Russia it is believed to drink further from a glass used in a toast is to dilute the meaning of the toast? I wondered from a cultural perspective what you thought about Old Gorky and the throwing of the wine glasses. It was certainly hilarious. These are very good questions, Anti, I'm happy to answer. Earlier we touched on the theme of Russian image in The Avengers relatively Olga in an episode The Correct Way to Kill, where I confirmed that the actress Anna Quayle (by the way, very talented actress) coped well with this role that reminded me of one of the teachers at my school. As for Old Gorky, his character is one of the most interesting in the episode Legacy of Death, along with Sidney Street and Humbert, but unfortunately I have to disappoint you, he does not look like Russian man in whole. His mannerisms and accent are too willfully to be true for one of the Russian image in movie & TV and for me personally it is closer to the comedy character of the old Italian comedy. Only two things can be said that he is trying to play Russian, it's winking eye and breaking of glasses. You could calculate the trader or simply Russian dodger on manner winking eye in the USSR, but at the time I usually feel some kind of trick, and went aside, second, breaking of glasses, I can not say exactly when this idea has formed, but Russian poet Sergei Yesenin loved it. Breaking of glasses in the USSR was mostly fun for fun people at the table who are either talking about funny incidents or gambled. Sometimes this was done in a sign that you trust each other. Almost never done this if adults talking about something serious. So breaking glasses - it was a matter of merry people and eccentrics, that well fits for the image Old Gorky. Yes, it makes it Russian, but his actor manners of playing against him. I love episode Legacy of Death because it was one of the first that I've seen. This is a very good comedy and parody no only on The Maltese Falcon but and on the noir genre. All the actors in their place and their caricatures vividly imprinted. I must say I found this episode more ridiculous than for example the TV series "Get Smart". I love the actor Tutte Lemkow, as I remember his in all the movies where I saw him. He was already great for me as a dancer in John Huston's 1952 film Moulin Rouge, bit part, but as he is wonderful! I can confidently say that Clive Revill is good image as Russian in episode Dead Men are Dangerous. I personally believe that this is the best Russian image throughout the whole series. I saw the films of Clive Reville earlier, good actor, but when I first watched him as Mark Crayford, I was amazed. You know, if it was not a familiar face, I would thought that he is guest actor from the USSR. This is how he must convey facial expressions, manner of speech, movement and vision to translate all of this into a nearly perfect shape? I believe it is so professionally that you simply will not be able not to admire this actor. I empathized with his character throughout the episode, I was imbued with emotion and I was sad when he died. Here's what it means - to achieve creative goals and the ability to squeeze out all the possibilities. This gives us the conclusion - Clive Revill is unique actor and I'm sorry that he did not went in the direction of many roles in the classical dramas in film and television. I can also select an image Grunner in the episode Fog, his speech was not even translated into Russian in Russia. There's a lot of fun for those who understands Russian. Sparkling humor Gunner is almost every sentence: "Hello" instead "Bye", "No, Do not boom boom" etc. Well, when I listened to it all, I thought that Frederick Paisley made ​​a significant contribution to this episode. Do you remember a Russian diplomat in the episode "The Gladiators"? I would say that it is - a mixture of Pierre Richard, Russian businessman and a bit my humor. Moreover, all that he spoke about Steed is true that he very Russian. Patrick Macnee in the second season TNA looks in his role very believable as Russian, and the phrase Russian diplomat rather cemented fact. 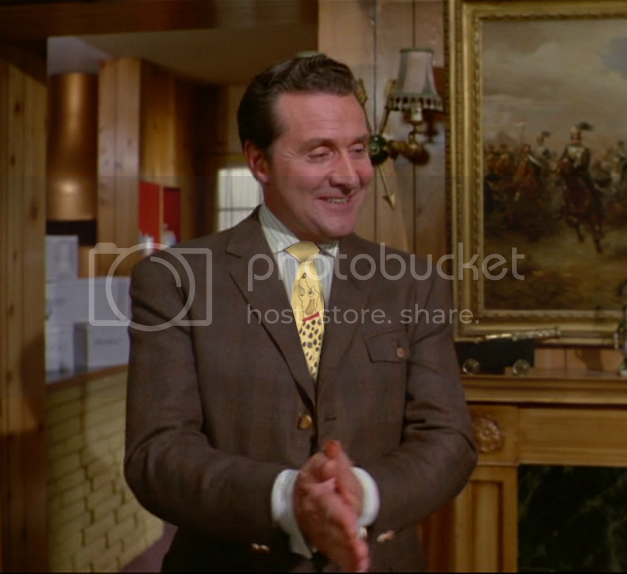 Ha, well, I sometimes imagined the adventures of Steed in Russia, where he would have had a good apartment near Red Square, car Volga, and sometimes be met with old friends like Olga and Brodny. Incidentally I think Brodny, too, unlikely as the Russian in the episode "The See-Through Man", although significantly better than in the episode "Two's a Crowd". The image is clearly Cartoon and those places where character even hits the clowning, shows how it is different from Russian clowning. Well his clowning characteristic British type, the most obvious point that Russian would simply do not had joke about the dog outside window and the similar final monologue. Completely implausible is Ivanoff in the episode "The Girl from Auntie." Perhaps the most horrible Russian in the series. Considering the other characters, it makes sense that mostly Russian in the series were produced better in the later episodes of series.